Alex Ness can clearly remember his first encounter with Spyro The Dragon. It was 1998, Toys For Bob was working on 102 Dalmations: Puppies To The Rescue for the PlayStation, and Insomniac Games' purple dragon had just set a new yardstick. It was a visually splendid demonstration of Sony's debut console. It explored similar ground to 102 Dalmations. It had music by Stewart Copeland from The Police. Frankly, it made Ness jealous. "We even kinda stole some of their ideas," he says sheepishly. "Particularly the way they build their mesh. We kinda liked it." 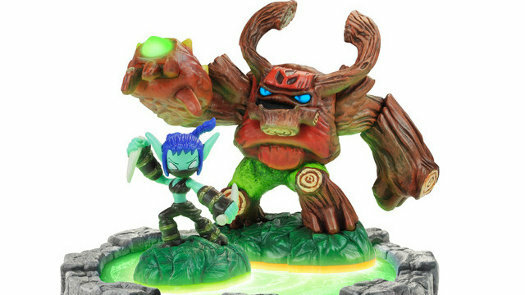 Any creative debt Toys For Bob owed to Spyro for its light-fingered creativity has been repaid ten-fold with its latest release, Skylanders; an innovative hybrid that allows players to add new characters to the game world by purchasing figures from an ever-expanding range - 37 toys across 8 elemental disciplines - and placing them on a portal. It displays the sort of fly-or-die ambition that many feel has steadily disappeared from AAA game development in recent years, and it has paid off handsomely for Activision. At the beginning of last month, the publisher announced that it had sold 20 million Skylanders toys, and its retail partners had only one complaint: empty shelves. According to Ness, a producer at Toys For Bob, things could have been very different. "It was going to be for an older audience, a darker take on it for the next-gen systems," he says. "We worked on some concepts there, but we wanted to go in a different direction and do something more for a younger audience that really rebooted the franchise." Toys For Bob spent the latter part of 2009 exploring ideas with the potential to bottle some of the lightning that had powered the Wii to such enormous success. Returning Spyro to the sort of popularity it enjoyed in the PlayStation days was going to take more than moody lighting and gratuitous blood. Nintendo had shown the borad appeal of creating new ways to play, and Toys For Bob endeavoured to do the same. "We had a lot of different ideas, and some of them were pretty crazy - one of them involved hats," Ness recalls with a grin. "But the one that we gravitated towards the most was the one that involved toys... The emotional connection that we have to toys and the representation of our childhoods - it just seemed like the perfect fit." In recent weeks, the big story surrounding Skylanders has been about scarcity. Retailers and consumers are complaining of stock shortages in the face of the product's burgeoning popularity, and some corners of the press have suggested that Activision is limiting supply to fan the flames of demand. "I can tell you that, as a public company, we're definitely not," Coyne says, chuckling. "Having worked in that industry on this type of property, that's not a tactic they tend to use. It's not deliberate, because you want all the sales you can get. I think it's a sort of consumer urban legend." "With Skylanders, we have factories going 24 hours a day, we're having planes bring the product over to get as many on the shelves as possible... When something is hot it seems like there aren't enough, but there are a lot coming in; it's just that they evaporate the moment they hit the shelves." "We were in love with the idea, but at first we were a little sceptical. Activision has never made toys before, and we're asking them to make millions of these little toys that will work with the game. We thought they would just shoot it down." To a degree, those fears were understandable. In 2010, as now, Activision was the industry's biggest publisher, its business founded on a clutch of world-beating IP. More to the point, Activision had a reputation, justified or otherwise, for being averse to risky ideas, and Toys For Bob's pitch was nothing if not risky. But it was impressive: the lead character artist, I-Wei Huang, spent his free-time crafting and painting intricate clay models for his own amusement; one of the programmers had a private fascination with electronics. So when Toys For Bob walked into the Activision boardroom to show the fruits of its labours, it had a functioning portal and several figures already built. "When we pitched the idea we were really able to show it," Ness says. "It might have been the difference between us all being fired and having a successful game." Jon Coyne, Activision's vice president of marketing and a veteran of the toy industry, remembers the meeting well. Many ideas make it into development at Activision, but not everything makes the cut in terms of resonating with the consumer - what Coyne refers to as, "the ultimate proving ground." 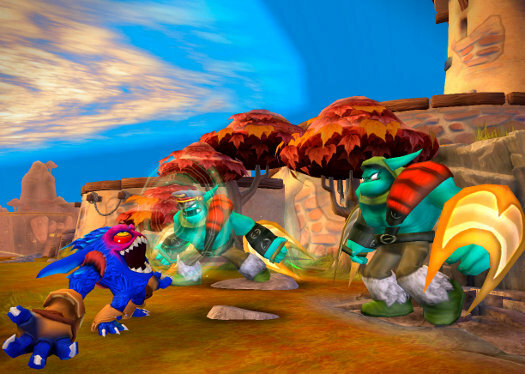 With Skylanders, however, the potential was clear from the very first pitch. "I came from the toy industry, and was fortunate enough to work on a couple of other things that had this big franchise appeal - things like Pixar's Cars," he says. "I think early on you can sense if something is going to resonate with kids in particular. I saw Skylanders two-and-a-half years ago, and I thought if it lived up to the vision it would be incredible." Toys For Bob was very clear on one thing: for Skylanders to work it would require a commitment to quality that very few games targeted at children and families enjoyed. Nintendo had inspired the push to find a new mode of interaction, and the resulting concept demanded the same degree of polish and attention to detail. According to Ness, the team feared orders to work faster or more cheaply, but the opposite turned out to be true. "[Activision] could see it getting to this next level that we wanted to take it, and gave us resources and time and actually pushed us to make it better and better... They were like, 'No, we're going to give you more.'" Toys For Bob worked on Skylanders for longer than any project in its 23-year history, and the last 12 months of its development was spent testing and polishing. During that period, parents and their children were brought in regularly and monitored as they played with the toys, the portal and the game, leading to the excision of a number of ideas that had previously been core to the experience. Ness credits the fluid, unstructured way characters can enter and exit the world to these sessions - a quality Coyne highlights as one of the key drivers behind the size and popularity of the Skylanders toy range. "The concept was good and interesting, but if we didn't deliver a super high-quality game it would just be a novelty and be dismissed," Ness adds. "There are plenty of peripherals that come out and just fall by the wayside. There's probably millions of them just in warehouses somewhere or buried underground." Among those plastic carcasses are more than a few unloved Guitar Hero instruments and unopened Tony Hawk: RIDE skateboards. Activision has sailed these waters before, and returned with only diminishing sales and, in RIDE, its most high-profile failure of recent years. The difference with Skylanders, Ness argues, is its focus: Activision may be a game publisher and Toys For Bob may be a game developer, but the popularity of Skylanders is all about the toys. "Skylanders is bringing your toys to life," he says. "A lot of ideas as we were making the game got scrapped because they didn't fit into that - making the toys come first." In that sense, Skylanders is unique, and a unique challenge for a company like Activision. 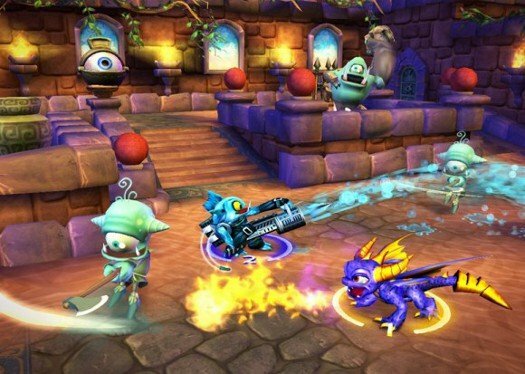 Unlike most games, Skylanders required the support of retail partners from the early stages of its development, and Coyne credits their enthusiasm as, "one of the reasons why we gave the game as much support as we did." "Everyone who saw it saw it's potential. You can speak to someone over the phone or send them a PowerPoint, but it really took off when [retailers] were able to hold something in their hands, place it on the portal, and see it come to life in the video game. Once they got to interact with it, that's when they understood." It also gave Coyne some valuable insight for his approach to the marketing. 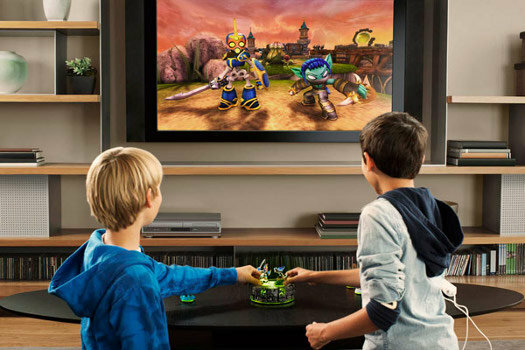 Ultimately, television was the principal means of communication with the parents and children Skylanders was targeting, but Activision also "invested heavily" in demonstration tours of the US and Europe. During the course of our interview, Coyne refers to "the magic" of Skylanders numerous times - the moment when a child places a figure on the portal and sees the character appear in the world of the game. A significant amount of Skylanders' appeal can be traced back to that moment. It excites the player in a way that tends to make marketing people very pleased, energising them to not only buy the product and seek out more characters, but to introduce that "magic" moment to their friends. But that organic momentum comes post-launch, and with video games launch day tends to be the moment that the marketing budget runs dry. "Generally, in videogames, a lot of the marketing is building the buzz and excitement up until the launch, and then it launches and you have day and week one sales, and then things go a bit quieter - it runs its course," Coyne explains. "Whereas in consumer goods and in toys...there isn't usually a lot of marketing pre-launch; you wait until the product is on the shelves and people can buy it, and then you turn on all the marketing and all the support activity and maintain that through it's life-cycle." "With this, we need to do both. So we had the pre-awareness and building the buzz, and then we launched and we really turned the volume up on the marketing. And even now we keep that going, because it's got that longer tail with the extra characters to buy." But for every child whipped into a frenzy by the Next Big Thing there is a beleagured parent under pressure to spend their money on the object of their fancy. With dozens of Skylanders toys already on the market - if you can find one, that is - journalists have been queuing up to point out that assembling the 'complete' Skylanders experience is a costly process; whether pounds, dollars or Euros, the price would be in the hundreds. According to Coyne, the quality of both the game and the individual toys is high enough to assuage most people's concerns over the price-point, and Ness insists that creating value for consumers was one of Toys For Bobs' top priorities. "A lot of us are parents, and we're certainly gamers, so we had those same thoughts too," Ness says. "We wouldn't want to feel ripped off, and so the big challenge was we really didn't just make a game - we made two games, in a sense." The Skylanders Starter Pack retails for around £50, and includes 3 figures, a copy of the game, codes for its accompanying free-to-play online world, Skylanders: Spyro's Universe, as well as a a poster, stickers and trading cards. It's worth noting that each item in the Starter Pack hints at yet more branded products that could contribute to Skylanders' revenue, but Ness is confident that the basic offering can stand beside any comparably priced product out there. "We wanted it so that if you never bought another toy and just got the starter pack you got a full experience," he says. "But we also wanted to reward the people that buy more toys. We wanted them to get value and extra content in the game, and make them want to buy more." At around £8 each, the Skylanders figures have proved to be largely immune to broader consumer habits. Coyne claims that sales actually rose after the Christmas period, as word-of-mouth and "playground chatter" among children returning to school created a natural momentum. The next full release for the franchise will be Skylanders: Giants, which will introduce a series of larger and more expensive figures to collect. The suggestion that the new figures could be regarded as a cynical tactic on Activision's part is waved away. The toy business is sensitive to over-saturation, and the Giants range will be far smaller than the Skylanders range as a result. Indeed, Coyne regards each new figure as equivalent to a Call of Duty map-pack in terms of the extra value it adds for the consumer. "Yes, [Giants] will cost slightly more, but there will also be significantly fewer of them - there are only going to be 8 giants available, one for each elemental type," he says. "As a parent myself I am mindful of how much these things cost. And in our research, where we speak to mothers and fathers, Skylanders is often talked about as being good value, because the figures keep the kids interested in the core game - the big investment they've made - for longer." And like Call of Duty, there are bound to be imitators. It doesn't take a vaulting imagination to see what Angry Birds or Pokemon could do with Skylanders' combination of game, portal, and plastic toys, and now that its mass appeal has been firmly established I half expect both of those phantom products to be announced before the end of the year. And Coyne welcomes the competition; Activision has big plans for the Skylanders franchise, and won't cede its pioneer status any time soon. "Innovation is incredibly important no matter where it comes from, to keep things healthy and moving along," he says. "One thing that's great about Skylanders is that it's getting people back into stores on a regular basis, to look for new figures if nothing else. Driving that retail traffic is important for the whole industry." "When you're successful in something it tends to catch people's attention. Fortunately, at Activision we don't like to rest on our laurels either. We plan things out years down the line. Sometimes plans have to change depending on the various levels of success, but fortunately, and I think fortunately for the industry, this one has worked out." My 5yo son is obsessed with Skylanders and that obsession has partly passed to me. It's easily the best shared gaming experience we've had and even the price and scarcity of the figures hasn't diminished our love for it. So much so that I recruited John Davison (Gamespot.com), Ian Hughes (The Cool Stuff Collective) and Andy Robertson (Wired.com) to chat soley about the game on a recent episode of Media Pulp. Next we're recruiting one or two guys from Activision/Toys For Bob to answer our questions in a follow up. Can't wait for the sequel either! My children talk about Skylanders and 'play' it with friends during lunch break at school - this is without them ever playing the actual game on a console. The fact it's become part of their imaginary play says a lot. When Activision spins this off to cartoons, movies, comics and more toys it can only get bigger. And those are already in the works Matt. Amazon.de already has listings for Skylanders 2013 Album, Sticker Book and what appears to be a kids novel of sorts. I also read recently there'll be lunchboxes etc. No doubt some kind of cartoon has to be in the works now.